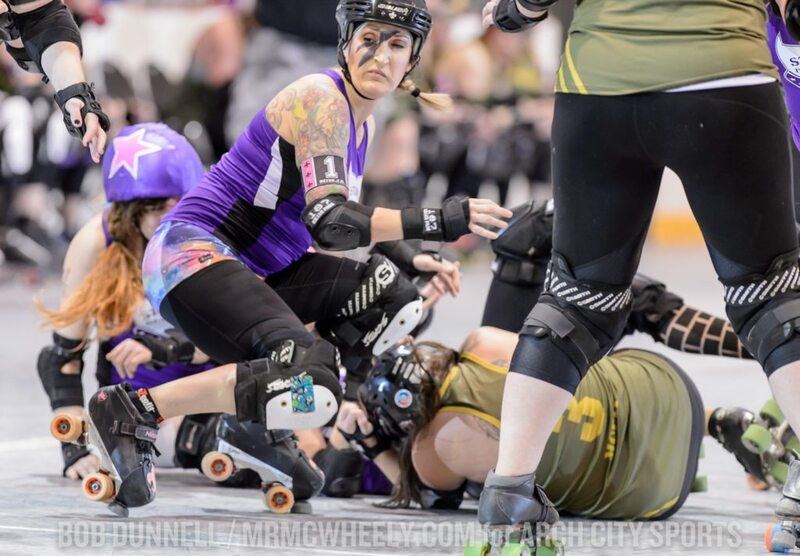 (BALLWIN) Event number four of the six-game regular season cycle for the Arch Rival Roller Girls and GateKeepers Roller Derby saw eye-opening and jaw-dropping results Saturday night. When the dust had settled , ARRG’s three-way tie in the league’s hierarchy was broken by the defending champion and GKRD’s second place team in its “Turf Wars” campaign jettisoned its way to a first-place tie on the men’s totem pole. In the women’s main event at Midwest Sport Hockey, the Stunt Devils rallied late for a 130-127 victory over the Smashinistas to grab the top spot in the ARRG standings. In the men’s opener, the Raiders of Forest Park out-muscled the Central West Friends 175-104 to force equal positioning in the GKRD pecking order. The flat-track action resumes at Queeny Park on Saturday, February 20 as both leagues’ extremely competitive regular season continues. When the two last tangled in November, the Smashies topped the defending league champion by five points. As anticipated, the re-match produced similar drama but the Stunts were able to flip the script this time around and win the three-point nail biter that was secured with the final jam. The victory gave the Stunt Devils its second straight win and pushed the team to first place in the standings with a record of 2-1. Tied 16-16 six minutes deep into the contest, Stunts’ jammer CupQuake notched a 9-4 rotation to give the defending champs a 25-20 edge at the 21:00 mark. Smashies’ jammer Harmony Killerbruise notched four points on the next rotation to shave the score to 25-24. With 17:50 left in the period, the Stunts’ Psychokid d Feakout pushed the score to 28-24 with a three-point tally. Two jams later, Killerbruise notched another three-point pass to whittle the margin back to a solo point, a 28-27 Stunts edge with 16:50 left in the half. The Stunt Devils score fourteen straight over the next three jams to build a cushion. Launched by Freakout’s trey scored in jam 11 and concluded by Bricktator’s 14-point power jam scored two rotations later, the Stunts widened the score to 45-27 with 12:15 left in the period. Undaunted, the Smashinistas went on a rally of its own and produced a 23-2 run over the next four jams that flipped the scoreboard. Jammer Hakuna Renata netted a 5-2 non-lead collection to launch the stretch rally, Killerbruise followed with a six-point strike and Renata added a three-point tally to sliced the score to 47-41 with 8:05 left in the period. Killerbruise posted nine with 6:50 left in the half to finish the surge and net the Smashinistas a 50-47 lead. The advantage was short-lived as back-to-back three-pointers by the Cupquake and Bricktator swung the pendulum back to the Stunt Devils, 53-50 with 5:05 left in the period. The Smashies regained the lead on the next rotation as newly-drafted jammer Blink posted a 15-pointer that gave her squad a 65-53 advantage with 3:20 left in the period. Once again, back-to-back strikes from the Stunts’ CupQuake and Bricktator, each of the four-point variety this go-around, narrowed the Smashies’ lead to 65-61 with 1:40 left. In the period’s penultimate jam, the Smashies’ EnYa Nightmare notched a crucial three-point jam that pushed the lead to 68-61. Killerbruise finished the half with a solo-point score to give the Smashinistas a 69-61 halftime edge. The momentum carried over into the second period and Killerbruise notched a 4-0 rally from the get-go that pushed the Smashinistas lead to 73-61. The Stunt Devils scored eleven straight points over the next four jams to make the donnybrook another one-point game. With blocking provided by co-captains Ninja Sass’Em and Danisaurus Rex, the newly-drafted Sue Bob Fight and Violet Opposition and the hard-charging rotations of Shear-Ra Powers, Pegasass, Aggie Wartooth, Cruella Belle-ville, Stormin Norma, Midnight Smack and Sound-Proof, the Stunts sliced the score to 73-72 with 25:15 left in the game. Smashies’ jammer Flash launched 13-3 run that encompassed the next ten minutes of clock. With assistance from blockers Shimmy Hoffa, Cloak N’ Drag-Her, Chewblocka, Girl Fawkes, Party RockHer, Party McFly, Fletch-A-Sketch, Bad Mutha T and Kannabis Korpse, the camo-clad troopers pushed its lead to 86-75 with 14:20 remaining. CupQuake notched five in jam 12 to narrow the score to 86-80 and then, following a scoreless rotation, the Stunts regained the lead as Freakout collected a nine-pointer with 14:30 left, resulting in an 89-86 scoreboard flip. Feeling the heat, the Smashies regained the lead, and then some, as Killerbruise notched a 30-5 momentum shifter on the next jam. Aided by a power jam and Stunt blockers sitting in the penalty box, the Smashies grabbed a 106-94 advantage with 11:30 left in the contest. An additional nine points were scored uncontested over the next four jams as the leaders pushed the score to 115-94 with 6:15 remaining. With its outlook looking shaky, the Stunts rebounded with a crucial jam with under five minutes remaining as CupQuake collected a 27-point strike to give the defending champs a 121-115 scoreboard flipping lead with 3:40 remaining. The Smashies refused to wave the white flag and scored five unanswered to slice the game to, once again, a solo point. Following Killerbruise’s four point tally with 2:25 left to play, the Stunts clung onto a 121-120 lead. A scoreless penultimate jam set the table for a heart-stopping finale. With the Smashies’ Killerbruise and the Stunts’ Bricktator donning the star for their respective teams, both squads tussled in the final rotation. Bricktator pushed her way to the front for lead jammer status but Killerbruise was also able to bust through the pack. Both jammers netted two scoring passes, but Bricktator’s 9-7 edge secured the Stunts’ inevitable 130-127 victory that gave the squad its second straight duke and sole ownership of first place in the ARRG standings. Bricktator topped the Stunts’ ledger with 53 points followed by CupQuake’s 51. The team will be idle next month. Paced by Killerbruise’s 84 points, the Smashinistas dropped to 1-2 in the ARRG standings but have a chance to rebound on February 20 as they meet the M-80s (1-1). STUNT DEVILS (130): Bricktator 53, CupQuake 51, Psychokid d Freakout 26. SMASHINISTAS (127): Harmony Killerbruise 84, Blink 20, Hakuna Renata 14, EnYa Nightmare 10, Flash 4. Comparable to the women’s match-up, the result of the men’s battle saw the team that suffered defeat in the prior meeting rebound for victory in the re-match. However, the Raiders’ eye-opening 71-point duke over the previously undefeated Friends not only avenged the previous loss but also forced a two-way tie alongside its adversary in the Turf Wars’ standings as both squads now possess identical 2-1 records. The Raiders’ Saturday template for success was displayed early in the first period. Trailing 11-8 two jams in, Forest Park snagged its first lead of the contest via Mouthful’s nine point strike that resulted in a 17-11 scoreboard flip with 24:30 left in the period. The Raiders never trailed again Saturday and cultivated a huge differential as the period progressed. Leading 22-16 heading into jam five, Forest Park collected 23 points uncontested over a ten minute stretch and commanded a 45-16 lead with 15:45 left in the half. Raiders’ blocking, paced by Spin Diesel, Atom Bomb, Wrecking Bill, Bower, Dr. Dredd, Oxford Coma, Mueller, Arty Panimal and Slammin’ T. Killa, kept perpetual pressure against the CWF consistent and continued to aid the flat-track assault. The Raiders stretched its lead to 88-36 with 8:10 left following Mouthful’s 20-point power jam. The Raiders possessed a 102-47 lead at intermission and continued its surge with a 26-0 rally in the opening ten minutes of the second half. Forest Park posted a 128-47 advantage following co-captain A. Black’s eight-point jam with 20:00 left in the contest. As the second half continued, CWF chiseled away at the differential with blocking up front from SoGo, Capt. Kramerica, Perc In Boots, Monster Jam, The Great Stromboli, Blue Suede Bruise, Poppa Choppa, Dent, Red Rider and Fruit Wall-Up. Jammer Mailbox notched a 24-pointer with 10:00 remaining to narrow the margin to 131-81. Raiders’ jammer Porter secured the victory with a 16-point strike with 8:30 left that pushed his team’s lead to 147-81. Forest Park outscored the Friends, 73-67, to pick up the 175-104 victory and improve to 2-1. Mouthful paced the Raiders with 65 points followed by Black’s 51. The team looks to pick up its third straight win, and clinch a slot for April’s Turf Wars title game, in a meeting with the Creve Coroners (0-2) February 20 at Midwest Sport Hockey. The Central West Friends, who dropped to 2-1 and will be idle next month, was topped in scoring by Mailbox’s 74 points. RAIDERS OF FOREST PARK (175): Mouthful 65, A. Black 52, Porter 29, Mueller 13, Spin Diesel 5, Oxford Coma 4, Dr. Dredd 2. CENTRAL WEST FRIENDS (104): Mailbox 68, The Great Stromboli 13, Fruit Wall-Up 8, SoGo 4, Perc In Boots 3.